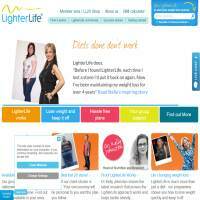 LighterLife aims to offer long term weight loss solutions using a slow-burn plan. This makes it easier to keep weight off after it’s been lost, rather than constantly flip-flopping between being lighter and heavier. They provide an offline support system in the UK as well as a variety of food products which help you to lose weight. The website is relatively low on information, so it’s not always easy to tell what you’ll be getting. There are several plans to choose from, depending on what you’re looking for – whether it’s a slow, consistent weight loss, a quicker option, telephone support or small group support with others in your area. If you need some advice, there is a live chat option which puts you in touch with a member of the team. This is very useful as it means you can discuss the differences between the packages, as well as asking questions about the foods or programs. Otherwise, there is phone support, or some information around the site. LighterLife.com keep their cards close to their chests, not revealing a great deal about what each plan actually involves. As such, £15 a week for group membership seems quite a hefty price to pay, particularly if (as they suggest) this is a long term solution. Not everyone can afford to pay so much every week, especially if you also need to pay for food packages every day. We’d like to see more information about what exactly happens when you join Lighter Life, as well as more online content regarding exercises, diet plans, food calculators, shopping lists and more. It simply feels lacking in these areas, boiling down to offering two basic services: food packages and group meetings. There are various success stories which offer some inspiration, although there’s not much of a sense of an online community to Lighter Life. Aside from the meet ups, we wonder how easy it will be to stay motivated if there’s little online support for members. Forums and chat rooms would at least offer an opportunity to speak to others when you’re not in a meeting, helping dieters through tough times if they need the help. If you really feel you’d benefit from a meet up group, LighterLife might be an option for you. However, the online content is lacking and this isn’t a cheap option. Before signing up, we’d recommend talking to the sales team using the live chat option, to find out what’s on offer and how it could help you to lose weight.